I used to read long books, but after I turned 50 (some 24 years ago) I decided if you can't tell your story in 400 pages--I'm not interested. There are so many books and so little time. That's fair. I do love getting lost in a long book, but it does mean slowing up the reading pace! I've seen several classics on people's lists. I haven't read any that you've mentioned. I'm still not sure I've I'd ever read any Russian classics or not. I need to read more classics, but I don't get in the mood to read them a lot. Russian lit tends to be lengthy, but I've loved the Tolstoy I've read! If you're not excited to read it, though, it would probably feel like a slog! A Storm of Swords is my favorite too, that book is just amazing (and heart wrenching at times). And Les Mis is definitely a chunkster! 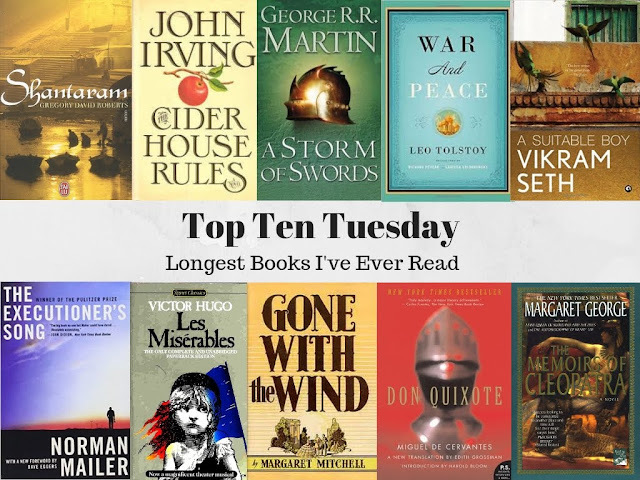 Sometimes I fall into big, long books and never want to come out, but other times I just can't stand the amount of time it takes to read long books, ha! I love the detail and world-building and immersion, but the time commitment is a drag for sure! I had a few of these on my list, as well - War & Peace, A Storm of Swords, and Gone with the Wind. I love a long book once in awhile! I couldn't read all doorstops, but every once in a while I think they're a great escape! War and Peace I've tried for years to read but have never been able to just down and actually get through it. Why the dislike for Don Quixote? War and Peace is a big one! I think it took me almost a month, and I usually read 7-8 books in a month! Don Quixote...I don't know, I didn't think the humor was that funny? I felt like I got the joke after the first hundred pages and then it was just the same joke over and over. It just never clicked for me. Wow! Those are some intense reads. Les Miserables is one of my sister's favorite books. :) I really like John Irving, but I haven't read Cider House Rules. I will have to check it out. Great list! Here's my TTT. Cider House Rules is so good! I've read a couple of his others and really liked them but that one's my favorite. Les Mis is wonderful, but it does take a loooong time to get through.